Reduce the negative effect on our environment, by using sustainable wristbands. 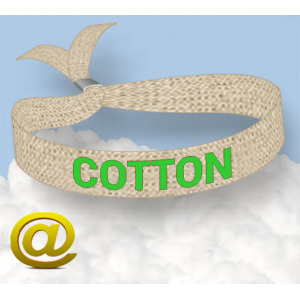 Buy 100% cotton wristbands at the market's absolutely best quality. Printing: one colour, screen printing. Lock: metal (or non environmentally friendly plastic lock). Production time: 18 days (calendar days)*. Express production + fees *. We will send you a layout for your approval and an order code. *Production time: ~18 days for order of 500 to 5000 wristbands. For larger or smaller orders please contact us. Size: Width - 15mm or 20mm ; Length - ~320mm. Graphic area: full wristband length. 'One size' fits all. S-M-L-XL.